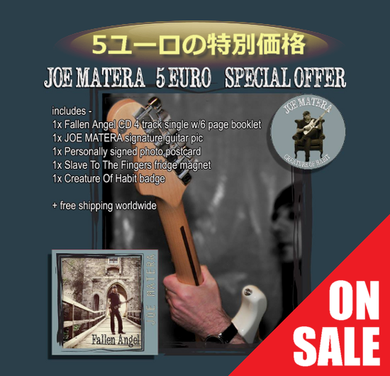 JOE MATERA made a special pack for €5, which is available only for mail order, is now on sale. It contains "Fallen Angel" 4 track CD + 6 page booklet, JOE MATERA signature guitar pic, signed postcard, "Slave To The Fingers" magnet and "Creature Of Habit" badge, and also FREE SHIPPING worldwide. Don't miss this opportunity! Contact JOE MATERA website or his facebook page, along with saying "I want 5 euro special pack! ".